This category contains the AUTOGRAPHS of royal personages and those connected with, principally, European Royalty and Royal Houses. These include AUTOGRAPH LETTERS, signed photographs, documents and autograph signatures. The Victorians had an avaricious thirst for such autographs and 19th century albums frequently contained the signatures of Sovereigns, clipped from appointments, commissions and other official documents. Good signatures still hold appeal but full letters and signed personal documents are obviously much rarer and the more desirable. Any perceived decline in interest in Royalty (if there ever was one) has been reversed in recent years and the autographs of Royalty are very much in demand and a strong field for collectors. 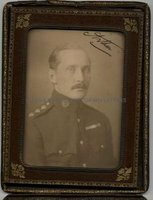 The majority of the autographs in this category are of members of the British Royal Family but also include examples from their, often related, counterparts in Germany, Russia and elsewhere. 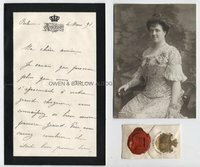 Scroll down for a selection from Owen & Barlows stock of Royal autographs.